My husband turned 40 earlier this year, and among the presents he was given was this. Bearing in mind that his birthday is in May, and that he never wears anything like this (he’s 40, not 80!) it was a case of politely saying thank you and then wondering what to do with it. He was never going to wear it, but giving it away or throwing it out seemed wrong. After all, the present giver had remembered that it was his birthday and had gone to the trouble of getting him a present. They probably meant well. It was probably not a joke. So as an alternative to offloading it onto a charity shop and then feeling guilty, I decided to turn the jumper into a cushion cover. It was very quick and easy to do, and is a solution not only for unloved birthday presents, but also for old clothes once worn by people who were very much loved. Keeping clothes in one’s wardrobe that used to belong to people who have since died can cause space issues. Turning a favourite jumper into a cushion cover is a way of keeping memories and little bit of that person still in your life. It could work equally well with old shirts too. There are lots of ways to turn a jumper into a cushion cover, but I wanted to keep things as simple as possible. I also wanted to keep its jumperiness. The buttons have stayed, as have the pockets. Actually, the buttons made things easier because they serve as the opening for the cushion pad, and the pockets are useful for keeping things, like ear buds or sweets for later! 1. Cut the top part of the jumper off, underneath the arms. 2. If you need to, pin the button bands so that the button holes are not pulling on the buttons. 3. Turn the jumper section inside out. 4. Decide where the seams will be. I wanted the cushion cover to be squareish, so I decided to resew the side seams about 4-5 cm away from the original seams. This was as close as I could get and keep the pockets as they were. Sew the seams and trim them if necessary. 5. Sort out your cushion pad. You might have one already that you could use. Alternatively, an old pad or a synthetic pillow can be given a new lease of life if it’s washed, dried, and then pulled apart and fluffed up. There are instructions for doing this here. 6. Turn the cushion cover the right way out. Put your cushion pad inside its cover and enjoy your new cushion! In the interests of being real, here’s a picture of my new cushion with its cushion friends and some mess. The pad of the reindeer one went weird in the wash and I haven’t sorted it out yet! After successfully managing to lose some weight, I’ve ended up with a wardrobe full of clothes that don’t fit, and the perfect excuse to make some new clothes for myself! Over the summer I made several new things, and by the end of August, I could manage a week of pretty vintage style dresses and skirts. Unfortunately, the end of summer meant putting the pretty things away and going back into things that were decidedly baggy and, in some cases, actually falling off. So I’m now in the process of making some winter outfits for myself. I now have a lovely blue dress with appliqued flowers on it, and a couple of weeks ago I made myself a winter circle skirt. I love circle skirts and the last one I made was from a duvet cover! This one I’ve made from some lovely wool plaid as cotton duvet covers aren’t warm enough for winter! They’re easy to make. Although there is a zip which I know might give some of you the heebie jeebies, there is an easy way to put them in. If you’re still terrified, you could use a button or ties instead. They are quick to make. Once you’ve made one or two, you’ll be able to knock one out in an evening easily. You could even make several at once as there’s nothing especially complicated about them and apart from the waistband, the bits are all the same. Fitting is easy. As long as it fits around your middle and it’s the length you want, you don’t need to worry! And if it turns out to be too long or too short, that’s easy to fix. Either cut a bit off or add an extra bit of fabric, a frill or some broderie anglaise. They look lovely on most people, regardless of body shape. There’s no gathering, so no extra bulk around areas you might not want to draw attention to. They’re lovely and swirly to wear, and if you’re in a foofy kind of mood, you could wear a petticoat or add some circles of net underneath. They’re the kind of thing that will work equally well whatever fabric you use. Personally I’d avoid stripes and big prints, but I can imagine them working if you match the patterns. I’ve made them in cotton prints, jersey, plain fabric, duvet covers, taffeta, chiffon, tulle and now wool plaid. You can wear pretty much anything with them! A t shirt, cardigan, blouse, jumper, or a vest will all go. So given that I love circle skirts and that I knew I could make one in the limited time I had, a winter circle skirt was an obvious choice! Warm fabric for the skirt, like a wool blend. Depending on your measurements and on the width of the fabric, you might need a couple of metres, or it might be 3 or 4. So check your measurements first! First of all you’ll need to measure your waist and decide how long you want the skirt to be. When measuring yourself, let the tape measure rest gently where the skirt will sit. Don’t be tempted to pull it too tight! We’d all like those numbers to be a bit smaller, but being able to breathe is more important! Jot down your waist measurement, then add 10 cm for seam allowance and ease. If you are planning on cutting 2 half circles instead of 4 quarter circles, you’ll only need to add 6 cm. When it comes to length, 62 cm is a good length for most people. A skirt of this length will come to just below your knee if you are of average height. If you are either very tall or very small, or if you want a skirt that is longer or shorter, you’ll need to measure yourself. The easiest way to do this is to dangle the tape measure upside down. When the the end is where you’d want the hem to be, make a note of the number at your waist. You’re going to be cutting the skirt pieces out from squares, so the next job is to work out how big the squares need to be. You already have some of the information because you’ll have worked out how long you want the skirt to be in the previous step. What you need to work out now is the distance from your waist to what will be the centre of the circle. The easiest way to do this is to take your waist measurement plus the extra cm for seams and ease, and divide it by 3. Then divide the answer by 2. Add this to your desired skirt length and this will tell you how big the square will need to be. Now you can cut the bits out! If you prefer, you can make a pattern piece which might make things a bit quicker if you decide to make another winter circle skirt. I don’t usually bother, partly because I know I’ll forget where I put it! Cut 4 squares of fabric with each side being the same length as your desired skirt length plus waist divided by 3 divided by 2. If you are fairly slim, you might be able to cut out half a circle by folding the fabric in half widthways. The thing to remember is that for your winter circle skirt to hang properly, the grain needs to be running up and down the centre front and back. Choose which corner will be the top of your skirt. Using pins and a tape measure, start at one side and mark off your desired skirt length plus waist divided by 3 divided by 2. Measure across the skirt to the other side, keeping one end of the tape measure at the top corner. Go back to the top corner and one side, and this time mark off your waist measurement divided by 3 divided by 2. Now cut out where you have pinned. You should have what looks like a quarter of a doughnut. You’ll need 4 of these! With cotton fabric, it’s possible to cut out all 4 quarter circles together, but if you’ve chosen something thicker for your winter circle skirt, it’s probably safer to cut them out 2 at a time. Cut the lining out in the same way. Just make your overall length 10 cm shorter. Cut a piece of fabric the same length as your waist plus a bit extra, and 10 cm wide. You might have to cut 2 pieces and join them. If you’ve ended up with 4 quarters, sew the front and back sections. If you cut 2 half circles, you can skip this step! Take 2 of the quarters and pin them, right sides together, along one of the straight edges. These straight edges should have the grain running up and down. Sew, then trim the seam. Press it open. Repeat with the other 2 pieces. If you have some safety pins handy, you might like to use those instead of pins. This is a tip from Julie of Sum of Their Stories and it definitely beats jabbing yourself with a pin! Pin one of the side seams near the waist. Put the skirt round you and pin the other side. You might need to adjust the pins a bit so that the seams on each side are the same. On one side, mark where you have pinned with a pencil or tailors’ chalk, then unpin it. Take the skirt off and repin the side seams. Sew both seams. Trim and press the seams open. If your lining sections are in quarters, sew them together to get a front piece and a back piece. Pin the front and back sections together, using the skirt as a guide for the side seams. Sew the seams, trim and press. Sewing the zip to your winter circle skirt is much easier if you sew the lining to the skirt first! Make sure that the side seams are matched up, then sew the lining to the skirt a cm (1/4 inch) or so from the waist. You can do this either by hand or on the sewing machine. I decided to sew the zip on top of the lining because it’s easiest. If you’d like a neater finish, you could sandwich the zip between the lining and the skirt instead. Using the zip as a guide, unpick some of the side seam of the lining. Pin the lining to the skirt at the bottom of the bit you unpicked. Check that the unpicked bit of side seam of the lining is matched up with the side seam of the skirt. Now pin the zip over the unpicked lining seam and the skirt seam. Tack the zip in place, checking that the teeth of the zip are over the seam. Sew the zip. This is easiest with a zip foot, but you can still do this if you don’t have one. Now unpick the part of the skirt seam that’s covering the teeth of the zip. When sewing the zip, it’s easiest to start some way down from the zip pull. When you’ve unpicked the seam, move the zip pull down into the bit you’ve sewn already, then sew the top of the zip. If you need to join the pieces of your waistband, do that now. Fold the waistband in half lengthways and press. Your finger will probably do! If not then use the iron. Open it out, then fold the long raw edges into the centre. Fold it in half lengthways again and press, with your finger or with the iron. Unfold the waistband. Pin one of the long edges to the waist of the skirt on the wrong side. The waistband needs to be face down, so that once you have sewn it to the wrong side, you can fold it over the raw edges using the creases you pressed into the waistband earlier. Sew the waistband to the skirt, keeping close to the folded edge. Leave a couple of cm either side of the zip. Now fold the waistband over to waist of the skirt. 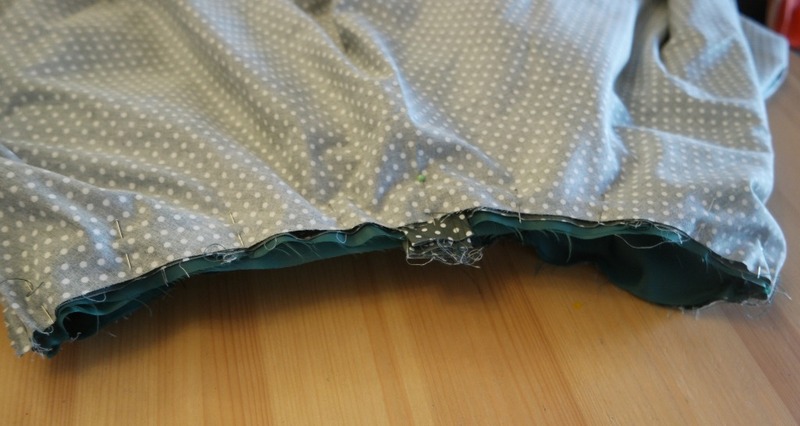 Tuck the raw edge of the waistband underneath so that all the messy bits are enclosed. When you get to the zip, tuck the ends in and sew. The easiest way to finish the hem on your winter circle skirt is with bias binding. As it’s going to take quite a lot, it’s best to leave it on the roll. Starting somewhere inconspicuous (A side seam is a good place), pin one end of the bias binding to the skirt on the right side, so that the right sides are together. Sew the bias binding to the skirt, keeping close to the folded edge. When you get back to where you started, overlap the ends of the bias binding by a cm or two and sew over them. Fold the bias binding over so that it’s all on the underneath of the skirt. Press it, then sew the bias binding to the wrong side of the skirt, keeping close to the other folded edge. Finish the hem on the lining in the same way. Trim away any stray threads, run the iron over it and your winter circle skirt is ready to wear! When you find a pattern you like, do you make lots of versions of it in different fabrics? It’s taken me a while to find my comfy spot clothes wise, but now I’ve found it, I have lots of vintage style things in my wardrobe that I love to wear! The Cherry Blossom Dress that I used for the sewalong in the summer is the pattern I’ve used as a starting point. I currently have 4 versions of that dress in my wardrobe (admittedly 3 of them don’t fit any more! ), plus one that’s very similar but has a different neckline, a sundress and a halter neck version. I also have a couple of circle skirts and a circle tutu. It might be my imagination, but it seems to me that there are more patterns (and more tutorials) for sewing summery things than for winter clothes. It’s an odd thing. I love making things from pretty cotton fabric, but that doesn’t mean I want to be mooching about in shop bought things in boring colours when the weather’s cold. There’s plenty of choice when it comes to warmer fabrics, so why the lack of choice when it comes to patterns? One answer to this is to take one of your favourite summer patterns and adapt it a bit so you can make something wintery from the same pattern. To do this, there are a few things you’ll need to take into consideration. So here are some tips for sewing a winter dress from a summer pattern. When sewing a winter dress from a summer pattern, the first, most obvious thing to consider is fabric. You don’t want to be shivering in a little cotton dress when there’s snow on the ground! Cotton prints are an obvious choice for dress making. There’s a huge choice of colours and prints, it’s easy to sew and it washes well. Yet there’s plenty of choice when it comes to warmer things too! Flannel is nice for wintery things (not just pyjamas! ), velvet, tartan and suiting, especially a wool blend suiting are all options. There isn’t as much choice but there’s still a good range of colours. So if you’re sewing a winter dress from a summer pattern, leave the cottons to one side and have a look at warmer fabrics! So many wintery clothes seem to be in drab colours, but there’s nothing like wearing something bright and cheerful for scaring off the winter blues! There’s also no law that says you can’t wear pastel colours either if you really want to! They’re perfectly good wintery colours, especially if you combine them with a grey cardi or something sparkly. Tartan comes in a variety of colours and size of check. If you’re not feeling brave enough for powder blue or a bright purple and orange combo, a mild tartan might be a good place to start until you’re feeling braver. With a little bit of imagination, you’ll be able to work out which of your favourite summer patterns will lend themselves well to colder weather. A halter neck dress might not seem like the best of ideas, but made from something shiny with a foofy bit underneath, and a sparkly cardi or a shawl, you could wear it for a Christmas party. A sleeveless cotton dress could be made instead from wool suiting and worn over a long sleeved top. Other things might be less suitable though, so you’ll need to consider how you’re going to wear it and decide whether you need to adapt the pattern. Some outfits can be adapted easily to suit the seasons. Just because a dress doesn’t have sleeves doesn’t mean that you can’t wear it in winter! So when sewing a winter dress from a summer pattern, think about how you’d wear it. Will you wear something under it? Will you wear a cardi/jumper/shawl? Would it work with boots or would it be better with shoes? I prefer brown boots with pretty things. Would you wear it with tights? Or leggings? Or both?! If you’re worried about having cold legs, you could make the skirt a bit longer. If you’re going to wear it with leggings over tights, you could even make it a bit shorter! Some warmer fabrics might be itchy, especially if it is wool or a wool blend. Being warm on a cold day is a good thing but being driven by an itchy outfit isn’t! Adding a lining can make everything much more comfortable. Even if your pattern doesn’t have instructions for making a lining, it’s easy enough to do. Just make a second version of your dress out of lining fabric with a slightly shorter skirt. Then join the lining to the dress at the neckline and at the armholes. You might want to add some stitches at the waist too. I added a lining to this sundress, not because it was itchy but so that I could get a neat neckline without having to use facings. You could also add a lining to make your dress warmer. This is especially good if you’ve got your heart set on some beautiful fabric but it’s totally unsuitable for winter because it’s just not warm enough! I’ve already mentioned the length, but there are other ways in which you could adapt the pattern to make it more suitable for colder weather. If it has short sleeves, you could either leave the sleeves off so that you could wear a long sleeved top underneath, or make them longer. You could also change the shape of the neckline or the back of the dress if you’re worried about being cold! Another thing to consider when sewing a winter dress from a summer pattern is that you might have to allow a bit more for seams and ease. Using heavier fabric will probably result in bulkier seams. Although some fabrics won’t fray any more than cotton does, so might fray quite a bit, so cutting the seams right down might not be an option. Also if you’re planning on wearing your dress over something, you’ll need to allow a bit more for that too. The best thing to do is to try it on while your making it (always good advice! ), and make sure you’re wearing whatever you’re planning on wearing underneath it when it’s finished. Don’t trim the seams until you’re sure it fits! If you fancy having a go at different kinds of seams (lapped seams are good for heavier fabric), you might like to read this post here. Add a bow or a sash. Sew broderie anglaise to the bottom of the skirt (I did this here). Add different coloured sections to the skirt. So what do you think? Do you have a favourite pattern that you’ve reused? Would you consider sewing a winter dress from a summer pattern? Let me know your thoughts in the comments! It always makes me a little bit sad at the end of the summer when I have to put away my pretty dresses and dig out my dreary, sensible winter things instead. This year has been a good year for the pretty dresses. Not only did I manage to make 4 dresses and 2 skirts, it’s actually been warm enough to wear them. So wear them I did. Lots. I spent most of the summer galumphing around my little corner of Norfolk looking as though I was on my way either to a 50s themed tea party or an event for overgrown, elderly fairies. Now I’m in saggy, dreary things that don’t fit, but I have plans to change this one new outfit at a time! I can still wear pretty things even though it’s autumn. They just need to be warm pretty things I can wear with tights and leggings, boots and warm cardis. So here is DIY winter dress number 1! The fabric I used for my DIY winter dress is a bright blue wool that I was sent ages ago by the people at AW Hainsworth. They make woollen cloth for all kinds of things and the stuff they sent me is specifically for making clothes. It’s beautiful, kind of like felt but it drapes nicely and isn’t too thick. I’d never made clothes from anything like felt before, and I’m hoping it’s going to be lovely and warm when the cold weather arrives! I didn’t want to hem it or use facings because I was concerned about bulk. It doesn’t fray at all so I could have left them as they were, but I wanted to make them actually look finished! So I used so satin bias binding to finish the raw edges. It’s very similar to the dresses I made in the summer. The main differences, apart from the fabric, are that the armholes are bigger and I allowed more ease for wearing, as I would be wearing a long sleeved top underneath it. The skirt is also half a circle rather than a full circle, so it uses quite a lot less fabric. Here’s the tutorial if you want to make a DIY winter dress for yourself! If you’d like the templates for the flowers, you can have them in exchange for an email address. There’s also a free printable for recording your measurements. The details are at the bottom of the post. Wool or wool blend dress fabric. Small prints are fine but big prints and large checks and stripes are probably best avoided! I used 2 metres of fabric 145 cm wide. Felt or other fabric for the applique. Bias binding for finishing the raw edges. A 20 cm (8 inch) zip. Before you start on your DIY winter dress, you’ll need to take some measurements. If you’d like some tips for taking measurements, you can read this post here. You’ll need a piece of pattern paper or similar, larger than your largest dimensions. Mine was 50 cm (20 inches) square. Draw a vertical line the same length as the distance from the nape of your neck to your waist (or the top of your your shoulder if you don’t have somebody to help you!). Find your waist measurement and divide it by 4. Add a couple of cm to allow for the darts, a couple more for the seam allowance and a little bit more for ease, especially if you’re planning on wearing it over something else. Draw a horizontal line of this length at the bottom of the vertical line. Now take your collar bone measurement. Divide this by 2 and draw a line this length at the top of the vertical line. Divide your shoulder to shoulder measurement by 2 and draw a horizontal line of that length a couple of cm (an inch) below the collarbone line. Find your shoulder to bust line measurement and mark it on the vertical line. Divide your bust measurement by 4, plus a 3-4 cm for a seam allowance and ease (1 1/2 inches). Draw a horizontal line where you marked on the vertical line. Now join the lines up! To get the shape of the armhole, you could use a French curve if you have one, or a plate if you don’t. To draw the neckline, mark down from the top of the vertical line about 15 cm (6 inches). Using the French curve (or the plate), join this point to the end of the collarbone line. To add the side darts, mark a point about 8 cm (3 inches) in from the side and just below the bust line. At the side mark a point about 2 cm (3/4 inch) below the bust line. Draw a line from the first point to a cm above the point at the side, and another from the first point to a cm below the point at the side. Draw the waist darts in the same way. Draw a line about 10 cm upwards from the centre of the waist edge of your pattern piece. From the top point, draw 2 more lines that end a cm either side at the waist. To draft the back piece, redraw the pattern piece without the extra at the waist that you added to allow for the darts. To draw the neckline, mark a point 10 cm down the vertical line and join it to the collarbone line. When I was making my summer dresses, I didn’t bother with making a pattern piece first. Instead I cut it directly from the fabric. For this DIY winter dress, the skirt is half a circle but the grain still needs to be running up and down the centre. This means cutting it out at an angle, which is possible, but it’s easier and there’s less measuring if you have a pattern piece. Take your waist measurement plus 4 cm seam allowance and a couple of cm for ease (2 1/2 inches). Divide this by 3 and add it to your waist to knee measurement. I’m going to refer to this as your total length measurement! Cut a square with sides as long as your total length measurement. From one corner, measure across from one side to the other, marking off with a pen as you go. You should have a quarter of a circle. From the same corner, measure down your waist measurement divided by three, across from one side to the other. You’ll now have a quarter of a circle with a chunk missing from the centre, like a quarter of a doughnut. Unfortunately I forgot to take any pictures while I was cutting out the skirt! There are some pictures in this tutorial here if you need some. Cut one of each of the bodice sections, on the fold with the grain running up and down. Cut 2 skirt pieces with the centre of each piece running parallel with the grain. For the appliqued flowers, cut 6 of each circle, 6 stems and 12 leaves. 1. If you want the appliqued flowers on your DIY winter dress, you’ll need to do those first. Position them on the dress, pin, then sew them in place. Start with the stems and the leaves, then the circles. I sewed the circles together then appliqued them to the dress. This was probably easier, but I had to be careful when sewing them on because I didn’t want pink stitching on the brown circles! 2. Sew the darts. Start at the edge and sew towards the point. Don’t sew right up to the point, stop just before to avoid bumpiness. If you need more of a tutorial, there’s one here. 3. Sew the skirt to the bodice. Take one of the bodice pieces and one of the skirt pieces. With the right sides together, pin them at the waist. Sew. Repeat for the other bodice and skirt piece. 4. With the right sides together, sew the shoulder seams. Now try the dress on. Check that the darts are where you want them and that the waistline is actually on your waist! If they’re not, you might need to adjust the shoulder seams or the waist. When you are happy that it fits, trim the seams and press. 5. Sew the side seams. Pop your dress on inside out. Match the waist, then pin the side seams of the bodice. On one side, mark where you’ve pinned with chalk. Unpin that side and take the dress off. Repin the seam. Starting at the waist, sew the side seams of the bodice on both sides. Don’t worry, putting the zip in is the next step and it’s easier to do when you’ve already sewn the side seam! You might need to trim the armholes a bit so that they match. Starting at the waist again, sew the side seams of the skirt. 6. Install the zip. Decide which side you want the zip to be on. For right handed people this is likely to be the left hand side. If you’re left handed you might prefer the zip to be on the other side. Remember that when the dress is inside out the left hand side is on the right! Pin the zip over the seam and tack in place. When you’re pinning, keep checking that the teeth of the zip are over the seam. Sew the zip in place. This is easiest to do with a zip foot, but it’s fine if you don’t have one. Once you’ve sewn the zip in, unpick the seam to expose the teeth of the zip. If you need a more detailed tutorial, there’s one here. 7. Finish the raw edges with bias binding. For sewing the hem, it’s best to leave it on the roll. Unroll some of it and open it out. Pin one end of the bias binding to the skirt with the right sides together so that the edge of the bias binding is aligned with the raw edge of the skirt. Sew the bias binding to the skirt, keeping close to the folded edge. Fold the bias binding over so that the binding is on the wrong side of the skirt. Sew the other edge of the binding to the skirt. Finish the neckline and the armholes in the same way. I’m very happy with my DIY winter dress! It might need some more flowers though. What do you think? Don’t forget your flower templates and your measurements printable for your DIY winter dress! Please note that although these are free and I’m happy for you to have them, I do ask for an email address and you will be added to the Tea and a Sewing Machine Machine mailing list. You can unsubscribe from these emails at any time. If you’d like to know why I do this, you can find out here. This post is a little bit overdue! Back in the summer when the weather was warm (sigh!) I made this. I’d seen a dress on Pinterest that I rather liked. Actually I saw dozens I liked, but this was the one I decided to have a go at making! My vintage style dresses turned out very well, so I decided to use the same style and a similar method to make a halter neck dress. I’d never made a dress like this before, so it was fun to try something new! I also wanted an excuse to try out the printables from my ebook Designing and Making a Dress From Scratch. I wrote a post about designing the dress here, and another about drafting the pattern pieces here. And you can find out about the ebook here! Once the dress is designed and the pattern pieces are made and cut out, you’re ready to get sewing! The steps for this dress are in a slightly different order than for the other dresses I’d made. I was actually very thankful that I’d worked out the steps first as it saved me quite a lot of time with the unpicker! 1. Pin the darts in one of the bodice sections. Hold it up against yourself to double check that they are in the right place (hopefully you did this when you drafting the pattern pieces!). Pin the darts on the other bodice piece and the bodice lining. Sew the darts. If you haven’t sewn darts before (or if you have but it’s been a while!) there’s a more detailed tutorial here. 2. Pin the side seams of the bodice. Put the bodice around yourself to check that it fits. The centre front edges should meet in the middle. If you need to adjust the side seams, do so, then sew them. Trim the seams and press them open. 3. Make the straps. Take one of the strap sections and fold it in half lengthways. Crease it with your finger, then open it out. Fold one of the long edges into the centre. Fold the other edge into the centre. Fold the strap in half so that the raw edges are enclosed and pin. Sew along the open edge. In the interest of keeping things symmetrical, you might like to sew down the other long edge too. Fold one of the short edges inwards. Pin, then sew. 4. Pin the straps to the bodice. Try the bodice on again to work out where the straps need to go. They’ll need to be just in front of your armpit, in a similar to place to the straps of your underwear. Pin the straps to the bodice so that the raw edges are together and the strap is downwards. The straps will need to be on the wonk a little bit. 5. Pin the lining to the bodice at the top edge with the right sides together. Sew the lining and the bodice together along the top seam. Trim and clip seams and turn it the correct way out. Run the iron over the seam. 5. Sew the button bands to the bodice. To make the button bands, take one of them and fold it half lengthways. Open it out, then fold the raw edges into the centre. Pin it to the bodice centre edge so that the right sides are together. Sew, keeping close to the fold. Fold the button band around the raw edge of the bodice centre so that the raw edges are enclosed. Pin then sew, keeping close to the open edge. 6. Make the button holes in the button band on the right hand side. Mark with pins to show where you want them to be. Don’t forget that you’ll need a seam allowance at the bottom of the bodice! The easiest way to sew the button holes is with an button hole attachment on your sewing machine. If you don’t have one, you could try one of these methods here. 7. Position the buttons using the button holes as a guide and sew them onto the bodice. Do the buttons up. 8. Sew the skirt sections together. Take 2 of the skirt pieces. Check where the grain is if it’s not obvious! Ideally you want the grain running up and down the centre seam. Do the same with the other 2 pieces. It might be an idea to mark the centre seams with a pin. You should now have 2 half circles. Pin the side seams and check the skirt against the bodice. You need the waist to be the same size on both the skirt and bodice or you’ll run into problems when you sew them together! Sew the side seams. Trim the seams and press. Now repeat with the lining. 9. Sew the skirt and the lining to the bodice. Pin the skirt to the bodice so that the bodice is inside the skirt, the right sides are together and the waist of the skirt and the bodice are aligned. Check that the centre of the skirt is matched up with the centre of the buttons. Ideally the side seams should match too, but it will be less noticeable if they don’t. Now pop the lining inside the bodice so that the wrong sides are together. Pin the whole thing together. This is a bit fiddly! You might find it helpful to pin the skirt to the bodice before sorting out the lining. Try it on and check that the waist is in the right place. If it is, trim the seam and press. 10. Finish the hem of the skirt and the lining with bias binding. Unroll some of the bias binding and open it out. Pin one end to the raw edge of the hem so that the right sides are together. Sew, keeping close to the fold. When you get all the way round, leave a couple of extra cm so that it overlaps. Sew to catch the end. Fold the bias binding over so that it’s on the wrong side of the fabric. Press the seam, then sew the open edge of the bias binding. Trim away any stray threads and run the iron over it once more. Now your dress is ready to wear!